We are excited to introduce our newest purchase only 300 metres away from our base at the Slope Point Accommodation “The Getaway” is a 3 bedroom holiday house totally surrounded by farm land. This home is suitable for families and small groups of people. 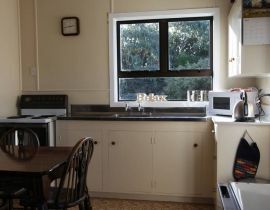 With a small courtyard, you can relax and enjoy the view over paddocks to see the Haldane estuary and the Waipohatu forest with family and friends. To add to this wee beauty, we have added a verandah for you to enjoy. Additional people $15 each per night. In the Getaway, there is a queens bed in the main bedroom. 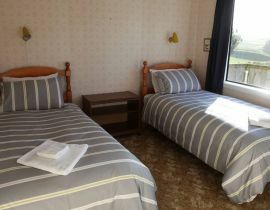 The other 2 rooms have 2 single beds in each. Extra linen is available. You will get free wifi there but ask that you just us it for the essential needs. 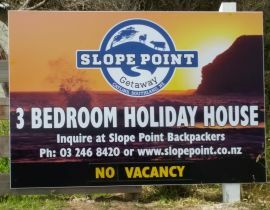 Guests are still welcome back to the main Slope Point Backpacker base for any reason. The pet sheep are always keen to see you. 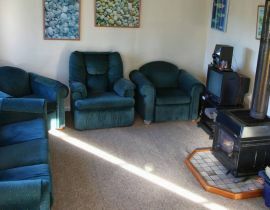 Book today to secure this wee gem in the southern most accommodation offered in the Catlins. Longer stays means a small discount on the prices above so you are welcome to contact us direct to confirm a price for a long stay.